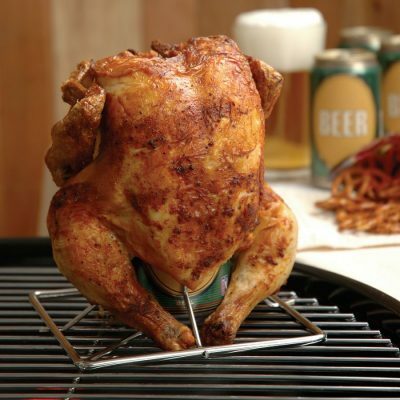 The collapsible beer can chicken stand by Charcoal Companion features foldable arms for easy storage. Place the can in the center of this chicken stand and the arms will click into place when raised. The smooth arms of this collapsible beer can chicken will make it easier to remove your chicken from it then from traditional stands. The long arms can hold a very large chicken or even a turkey breast. 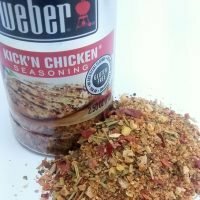 Can be used in the oven as well as on your grill. 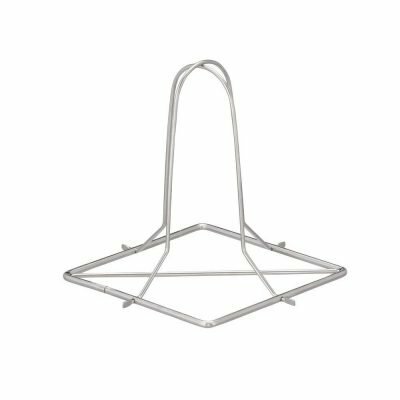 The stainless steel construction of the collapsible beer can chicken stand means that you can scrub the heck out of it, (beer can chicken is very hard on the stand) without fear. 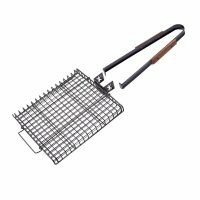 The large square base makes it very stable on the grill. 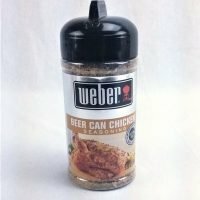 The rounded top beer can holders make sliding the chicken off very easy. The square base is 6×6 inches and the arms stand 7 inches tall. 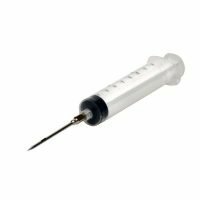 It will fit any normal shaped 12 ounce can and even some of the taller ones. 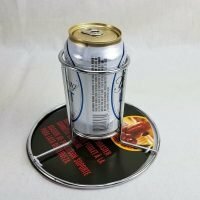 Warning: The metal of the collapsible beer can chicken stand and the beer can will get hot when cooking. 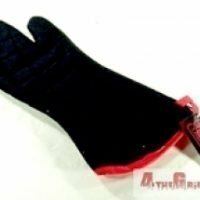 Always use an oven mitt or grill glove when handling this stand. Open a 12 oz. beer or soda can and drink half. 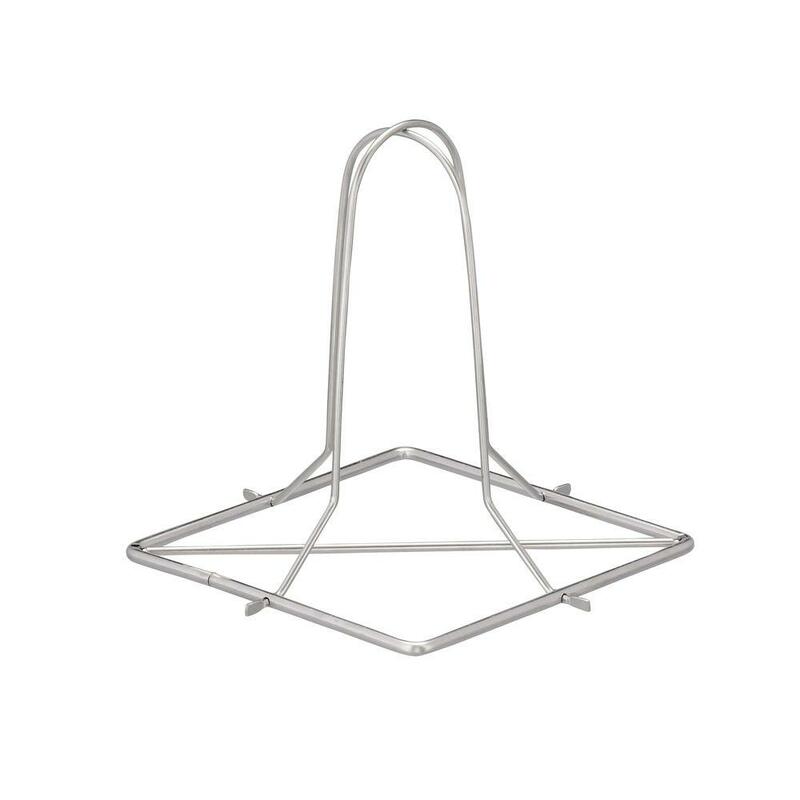 Place the can in the center of the rack. 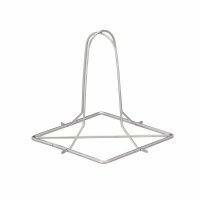 Lift up the arms of the collapsible beer can chicken stand one at a time and click the grooves in place. Make sure the chicken is thawed and clean. Apply your favorite rub or seasoning to the outer skin and inner cavity. 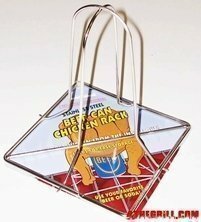 Place the chicken on the arms of the rack. Put the beer can chicken rack on the grill. As the chicken cooks, the beer heats and bastes the chicken from the inside, for juicy, tender, and tasty chicken! Yeah, stainless steel is the only way to go for a chicken stand. That stuff will cook and stick. 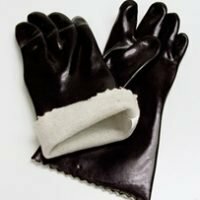 Sometimes you need to use a brillo pad to get it off.